Where should I install, production or sandbox? Reports, dashboards, folders, and custom fields all have names, which may conflict with existing names in your org. Now that you know what specifically you’re installing, you can decide where you want to install it. You can preview all of the components in the package during the installation process. Who should have access to these reports, dashboards, folders, and in some cases, custom fields? This is an area where you may want to do a bit of pre-planning before you install, so you don’t have to make updates to profiles and folder sharing settings after you install. Once your installation is successful, you’ll receive an email confirmation. Now you’re ready to go! This opens the Package Details page, where you can see all of the components, including reports, dashboards, folders, custom fields, and more. The easiest way to browse all of the reports and dashboards is to view them from the Reports tab in Salesforce. Now you can see all of the reports and dashboards you just installed. The very first thing you need to remember when modifying an existing report is to use ‘Save As’. The last thing you want to do is copy over someone else’s report! To clone your report, open a report and click the Customize button, then click the Save As button . Give your report a name, description, and save it in the My Personal Custom Reports folder. You can always move it to another report folder later, but this is a safe place to experiment with reports before you’re ready to have others use them. As you’re getting started with the AppExchange package, take some time to assess what reports and dashboards are in the package. Let’s walk through assessing a single report. In this example, we’ll be opening the Current Year Opportunities report from the Trending Opportunity AppExchange package. 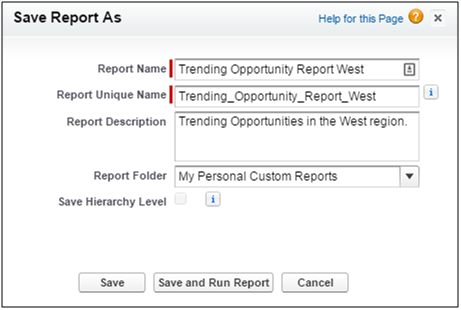 Open the Current Year Opportunities report and click the Customize button. At the top of the report, you’ll see a Show filter  with options for My Opportunities, My Team’s Opportunities, and All Opportunities. You’ll also see filters for the Opportunity Status , Probability , Date Field , and Date Range . To determine the Report Type used, click on the Report Properties  button. 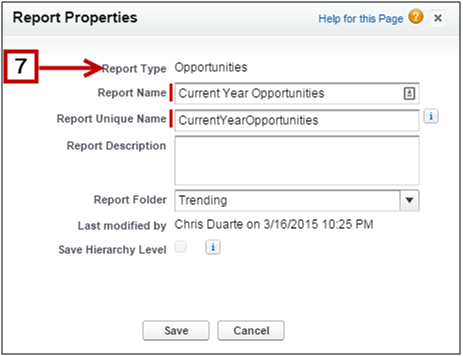 Once the Report Properties window opens, you can view the Report Type. Now let’s look at the report columns and report format. The report format governs the way the report data is displayed and grouped. Available report formats include Tabular, Summary, Matrix, or Joined. In this example, the report format is Summary . The columns used in the report are displayed horizontally in the preview panel . 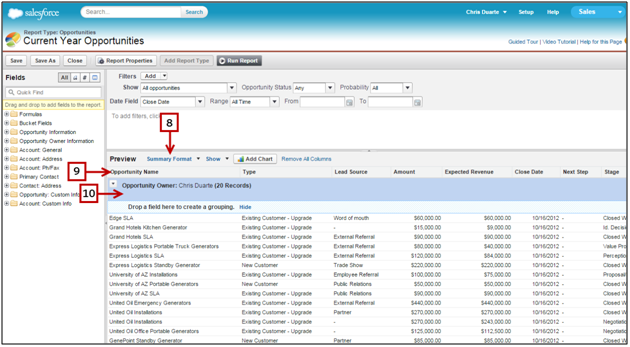 If the report format is Summary, then you’ll see an area where the report’s rows can be grouped by a specific field . In this example, we’re grouping by Opportunity Owner. As with reports, make sure you use ‘Save As’ so that you don’t copy over someone else’s dashboard! To clone the dashboard, open it up and click the Clone button . This will open up the dashboard in edit mode in the drag-and-drop dashboard builder. Now you can see how the dashboard was initially created. Let’s take a closer look. 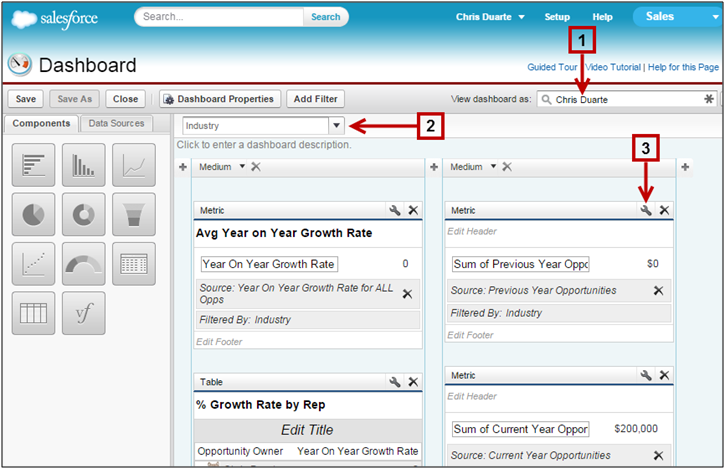 The running user for the dashboard determines what data is displayed. The higher up the running user is on the role hierarchy, the more data that potentially will be displayed . If the dashboard has any filters, look for them right above the preview pane . In this example, we’ve added one just so you can see where it would normally be. Click the wrench icon for each dashboard component . This is where you can see how the dashboard component is formatted and configured, and any conditional formatting that has been applied. As you’re getting started with modifying dashboards, one of the best things to do is simply change the dashboard component type. To this end, try taking a single report and build a dashboard with that same report displayed in each dashboard component type. This will give you a good sense of how each dashboard component type works. Now that you know how to install a report and dashboard package and you have assessed what’s in the package, time to start making modifications! Remember to always use ‘Save As’ and ‘Clone’ before you get started.